Every single airplane you’ve ever flown in has used mechanical bits of metal and composites on hinges to turn this way and that, hither and yon. The real dream is to fly through the skies like a goddamn bird, bending and twisting your wings instead, as God intended. Except for very few planes – the original Wright Flyer included – it’s been way too difficult, way too expensive, way too impossible. Unless NASA and MIT have their way. The problem with the way most planes change direction right now is that it’s not really, well, good. I mean, it’s good in that it technically works, your plane does in fact change direction, but it’s not great in terms of efficiency. The basis of the wing is rigid, and, while there are changes made with flaps and elevators and ailerons, the wing is never actually optimized for flight conditions—it’s just found a happy compromise. It’s the tech we’ve had for ages, and it’s what’s made the most sense. A rendering showing the potential redesign of aircrafts with the new tech, assembled by the orange robots. The new assembly system makes it possible to deform the whole wing, or parts of it, by incorporating a mix of stiff and flexible components in its structure. The tiny subassemblies, which are bolted together to form an open, lightweight lattice framework, are then covered with a thin layer of similar polymer material as the framework. And the best part is, the engineers at NASA and MIT have found a way to do this automatically. The new wing has been designed with a self-adjusting, passive wing restructuring system that doesn’t require any extra motors or human input to make it work. If this sounds familiar, well—it is. Hollow wings that can be constantly warped to make for more effective travel through changing air conditions? That’s basically what birds do. It’s the same concept that the first-ever airplanes used, except it was easier back then because planes were built out of nothing but wood and some fabric. It’s a lot harder when your whole plane is made out of rigid aluminum and steel, as planes began to become in the first decades after they initially started flying. And while the idea of a metal plane is a lot better than one made out of wood for a lot of reasons, it didn’t help engineers who never gave up on the idea of a twisting wing. 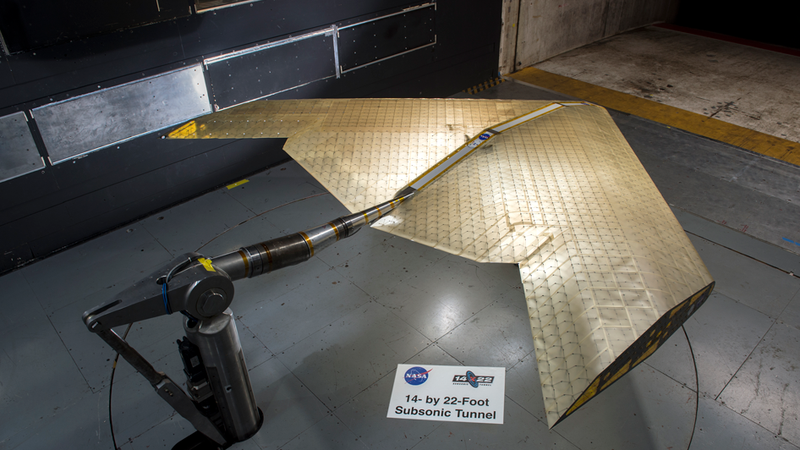 NASA’s still been interested in having movable wings, though, because those static metal tubes still aren’t the peak of flight optimization. Its wing-warping program dates back to at least 1996. They’ve been testing what they called “ a high-tech adaptation of the Wright Brothers rudimentary “wing-warping” approach to aircraft flight control”—the Active Aeroelastic Wing. The initial study was designed to research aircraft roll control by twisting the wing of an F/A-18A. The results were promising. A more flexible wing reduced roll rates and kept the plane steadier than it had been with a sturdier wing. The technology, though, still depended on a lot of ailerons, or, the hinges at the very end of the airplane wing that can be adjusted up or down to provide control. This new partnership with MIT represents the continuation of that research: how to design a wing without all those complicated mechanical bits. Basically, instead of retroactively outfitting an existing plane with new wings, how could NASA develop the entire plane around the concept of flexible wings? The answer to that question is the proposal you’re reading about here. The research has potential to not only optimize the flying process, but to optimize the production process as well. According to MIT’s research, the new tech encourages designing small subunits rather than giant wings, and it requires far less material than the current design. Material costs could go down as a result. But let’s talk about the real benefit for one second.